In my last post, I described how network visualization represents the beginnings of a method that will allow us to read between the written playtext and the theatrical performance. Its digital method focuses our critical gaze on the exchange between the words and bodies that work together to define Shakespearean performance by transmuting the words of the playtext into character relationships in space. We will compare the network graphs with the language of the playtexts and with still images from performances, to substantiate our claims at three levels of analysis. Using the network visualizations, we aim to address a pressing question in the digital humanities today: can computational methods can teach us something new about literary texts, or do algorithms and visualizations simply confirm readings, arguments, and theories we already know well. The promise of the network method lies precisely in offering to critics a new vantage point that would otherwise not be possible through a conventional reading of the text. The network allows us to rethink one of the oldest stories in Shakespeare criticism and pedagogy, what we will call the social disorder hypothesis. Since A.C. Bradley influentially defined the essence of Shakespearean tragedy as “division of spirit involving conflict and waste,” and not the ultimate reconciliation or renewal suggested by Hegel, generations of critics to the present have described the tragic nature of Hamlet in terms of thanatos: confusion, destruction, and violence that violates natural law, ethics, and social order. Readers of the comedies have developed a parallel hypothesis on social disorder in accounts of the carnivalesque. Drawing inspiration from the work of Mikhail Bakhtin in Rabelais and his World, a long tradition of critics has focused on the inversions and disorderings of political and sexual hierarchies opened up in the chaos of Shakespeare’s comedies. In this story told about Shakespeare, the tragedies and comedies draw their power and enduring interest from the subversive representation of social disorder. For the sake of space, the present argument focuses on Shakespeare’s tragedies, and acknowledges that the comedies and histories require further analysis. This canonical account of Shakespearean drama as a fictional space for the eruption of disorder severing social bonds and overthrowing political hierarchies certainly holds true at the level of plot, and Act 5, Scene 2 of Hamlet is one of the most striking examples of this. However, the critical vocabulary of entropy and chaos – incoherence, conflict, waste, violence, destruction, scattering and disproportion – used describe tragic plot as the unraveling of society and the destruction of human bonds, fails to capture the dramatic technique required in a performance to represent this “scattering” of the social on stage. The network in Figure 1 demonstrates that scenes of a tragic “scattering” disorder and the most disruptive and violent severing of social bonds are precisely the moments where the closest connections between characters are made, and the densest concatenation of network links exists. The network density at the end of Hamlet revises the commonly accepted notion, expressed most recently by Emma Smith, that “tragedies tend to move towards the isolation of a single figure on the stage, getting rid of other people, moving towards a kind of solitude, whereas comedies tend to end with a big scene at the end where everybody’s on stage”. The network structure suggests precisely the opposite. It is true that in this explosion of murder and political upheaval concluding the tragedy, all of the characters could not be more distant from one another in terms of kinship and affective bonds. 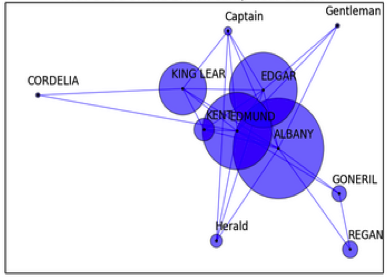 The network visualization of this culminating scene, however, suggests that the play enacts a “scattering” and destruction of Elsinore’s social fabric by crowding the characters into a more densely packed and interrelated social network. To put this point in narrative terms, at the level of discourse, the play links and intermeshes speakers and bodies in a dense knot so as to represent the intersubjective disorder between previously “close” or related characters at the level of plot. The network visualization of 5.2 pushes the characters at the moment of violence and the greatest political and filial disorder into uncomfortably close relationships – the dense proximity of characters in relation to one another signifies that they speak to each other much more and with higher frequency, in marked contrast to the distance between, and clear division of, bodies in space in the previous networks representing the scenes of Hamlet’s soliloquies. A more precise way to define network relationships lies in the concept of “clustering” from quantitative network theory. Mark Newman explains network clustering as a type of transitive relationship in space: “If vertex A is connected to vertex B, and vertex B to vertex C, then there is a heightened probability that vertex A will also be connected to vertex C. In the language of social networks, the friend of your friend is likely also to be your friend”. The network visualization of 5.2 exhibits such clustering behavior, with the scene populated by triangles of transitive relationships between all of the characters. The clustering displayed by 5.2 differs markedly from the “hub and spoke” model of 1.2, where Hamlet and Claudius serve as the social hubs around which the spokes of the network gather. The culminating violence of 5.2 displays a far more dense network clustering pattern, with the characters in the network interacting far more frequently with others, and not simply relaying their communication through the central figures of Hamlet or Claudius. A second way to think about the density of the network in this instance is the distance between nodes. 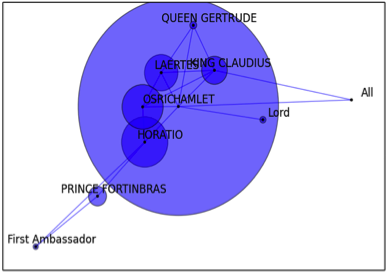 The close positioning of Hamlet, Claudius, Gertrude, Laertes, Osric, and Horatio at the center of the network signals a greater frequency of interaction between the characters than we have seen in previous scenes. In the dense clustering of the network, characters speak to more people, more frequently: the density of lines between characters traces the increase in interaction, and the decreased distance between nodes signifies a greater intensity of communication, with more frequent speech exchanged. To describe the density of the network in quantitative terms, 5.2 has 34 total network connections between characters, or 23.6% of total network links in the play as a whole, as opposed to the symmetrically organized scene of Act 1, Scene 2 above, which displays 9 network connections or 13% of the play’s total network links. 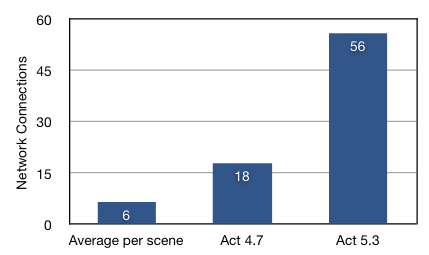 Additionally, 5.2’s 34 connections create a network that is approximately 450% more dense than the play’s average of 7.57 connections per scene (Figure 2). The clustering density of 5.2 describes a world unraveling with more frenetic social energy and thickly intermeshed social connections than we have seen in the previous scenes, which had exhibited relatively diffuse networks characterized by greater distance between characters and fewer total network connections between them. In the scene representing the destruction of the social order of Elsinore, the play constructs a social network to bind the characters being destroyed together at the moment of the greatest “scattering” and chaos. The positive act of theatrically connecting bodies in a dense network tells the story of the negative act of breaking apart the social bonds between characters that had held Elsinore together. 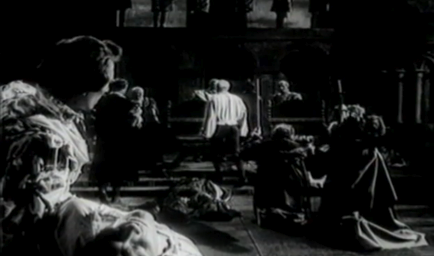 The dense clustering of characters and bodies in scenes of social disordering is not isolated to Hamlet. A scan of other tragedies substantiates the same logic of dense imbrication in a social network created at the moments of the greatest social unraveling. Figures 3-5 show several key scenes from King Lear that contain the key moments where filial bonds are broken and inverted, and where blood relations degenerate into bloodshed. Act 1, Scene 1 depicts Lear’s famous opening move dividing his kingdom into thirds in return for verbal affirmations of the strength of his paternal bond with his daughters, Act 2, Scene 4 represents the scene of conflict where Goneril and Regan strip Lear of his retainers, and Act 5, Scene 3 is the moment of tragic reversal where the web of filial and political betrayals leads to the deaths of Lear, Cordelia, Goneril, Regan, Gloucester, and Edmund. All of these scenes representing the rending of family bonds and the established political order exhibit heavily concatenated networks marked by clustering behavior, with a high number of connections between characters and a dense clustering of speakers in close spatial relation to one another. As an internal point of reference or control, Figure 6 shows Act 4, Scene 7, which depicts Lear’s reunion with Cordelia. This scene of re-establishing a family bond, a reunification and a linking together of father and daughter, results in a sparse network, with greater distance between affectively “close” characters, and fewer overall network links. To be more precise about the comparison of network density, the three scenes of greatest social discord disproportionately possess 73% of the plays total network links – the 3 scenes out of 26 total scenes contain 124 out of 168 total social connections. 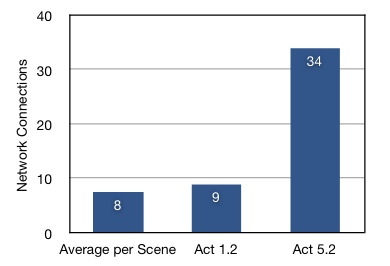 The anguishing conclusion of Act 5, Scene 3 alone has 56 network connections, or 33% of the play’s total, in comparison to the thinness of the reunion in Act 4, Scene 7, which has 18 connections, and to the play’s overall average of 6.46 network connections per scene (Figure 7). 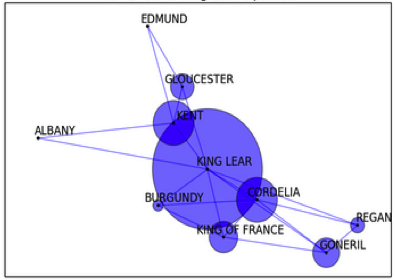 That a single scene containing the greatest moment of social discord has the densest network of the play by far, with 33% of the entire play’s social links or over 300% of the network ties compared to the scene of reconciliation with Cordelia, and over 850% of the average network connections per scene, shows that the “dissolving” (5.3.202) and “decay” (5.3.296) of the play’s social world densely packs the stage with speakers and with bodies as the performance strategy necessary to depict the act of “dissolving” the bonds between those speakers – a clustering in space so as to divide in the plot. The network thus visualizes the manner in which the play’s structure – the internal relationships between speakers formed by the text’s language – works according to a logic that is the reverse of the content or plot of the scene. The network functions according to a logic of clustering and increased social interaction that is the reverse mechanism of the plot’s dissolution of social bonds. 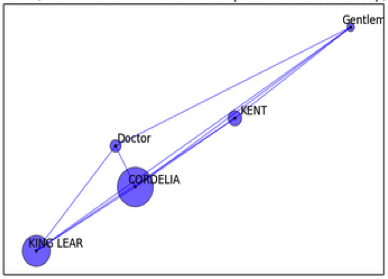 To extend the visual homology, the network of Act 5, Scene 2 in Hamlet corresponds to the arrangement of bodies in productions featuring actors as diverse as Tennant, Branagh, Richard Burton, and Sir Laurence Olivier.The network visualization is structurally analogous to the clustering of bodies that results in the various performances of Act 5, Scene 2 (Figures 8-13). In the networks and the performance staging, Hamlet lies at the focal point of the network of bodies defining the final scene. 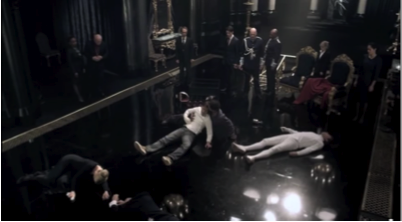 Claudius, Laertes, Gertrude, Horatio, Osric, Fortinbras, the Ambassador from England, and the “audience” all are clustered around Hamlet’s body as the hub of this final tragic tableau as a network of mangled bodies. To a certain extent, the film images demonstrate that the collision of bodies on stage as a way to precipitate conflict and disorder is somewhat obvious – characters need to be brought together to engage physically and to inflict violence upon one another. However, readers of Shakespearean drama such as Nietzsche, Hegel, Bradley, and other critics of tragedy in general in their wake have focused on the thematic content of disorder, chaos, and the breaking of the social order, without adequately acknowledging the organization of bodies in space – close connections and physical proximity – as the basic condition needed to create a theatrical frame for the tearing apart of human relations being expressed in the plot. The network and each film’s mise-en-scène cannot be identical since every performance requires interpretive decisions left open by the text to each director and actor. The point of the network analysis is not to say that every performance will be the same, which is obviously impossible. 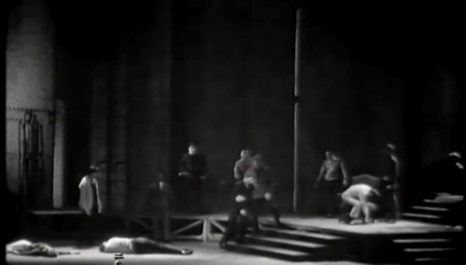 What is significant in the comparison in the network to the two performances is that despite the artistic latitude opened by Shakespeare’s plays, the underlying structural logic defining the relationship between the characters as a chaotic arrangement of bodies in space in this catastrophic scene is remarkably consistent. The spatial organization of the network describes a character-space that directors and actors populate with movements, gestures, and speech. We could examine many more scenes to compare the network to the performance as a mode of methodological control. 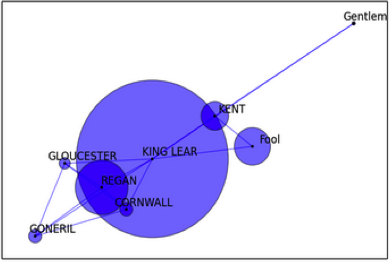 But beyond verification, the point of the present analysis is to suggest that the network visualization method can teach us something new about Shakespeare’s plays that revises a widely-held critical consensus. The network analysis performed here opens up a space for reading between text and performance and should not be understood as an authoritative account of tragedy. This represents the beginning of a methodological conversation, rather than the final word on Shakespearean tragedy in networks or in performance. I have argued that the network method is a way to harness the technical resources of the digital humanities to bridge the age-old divide between text and stage in the study of Shakespeare. The networks attempt to read how Shakespeare encodes within the text the spatial relationships of characters in performance space, and his plays give us a rule book of sorts to accomplish this, by meta-theatrically meditating upon how this translation of word to bodies in space occurs. The digital method reveals a network structure that allows us to revise a widely accepted story on social disorder and the overthrow of law in Shakespeare’s plays, but this is by no means exhaustive, and it represents the beginning of new readings made possible by network visualization. The network method allows us to tell new stories about Shakespeare, and provides us a different technical vantage point fusing textual close reading and the study of performance in space. Ultimately, we propose that the network technique opens a new perspective on Shakespeare’s dramatic art. Far from turning his body of work into a cold, inert dataset that seems antithetical to humanistic inquiry, the network method enlivens the text, allowing us to perceive the subtle manner by which the movements and energies of embodied theatrical performance inhere within the Shakespearean text.